Today we talk about Cars. In another country, that is. In Philippine, where information concerning cars dealerships around the country was incredibly difficult due to poor online prescence of numerous new and used car distributors. How about a one stop site where you can get the information you need? Pinoy Auto Traders came in! 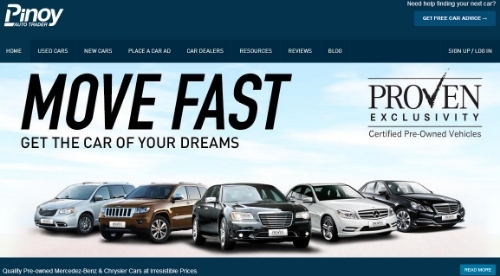 A Brief Introduction: Pinoy Auto Traders is the complete online marketing solution for the Philippine automotive industry and is committed to connecting car buyers with private car sellers, used car trade dealerships and new car distributors. Aiming to become a strategic hub for the collection and dissemination of marketing data and industry related statistics for the entire domestic automotive industry. We spoke to the Founder/CEO, Mr Daniel Scott and one of the Pioneer Employees, Mr Augustianne Laurenne L. Barreta (Senior Developer) on the initial stage of Pinoy Auto Traders. The Team at Pinoy Auto Traders! Well the initial thought process was about finding those who I knew in their day jobs who would be willing to put in extra work and had a great attitude to do whatever it takes. So working late nights and weekends were essential, so finding those who could mentally do that and who did not have heavy family or social commitments was also a factor. Obviously the initial employees had skills that covered all the areas we needed, which were a CTO, senior developer, lead designer/UX, product/project management and operations. The initial 5 could cover all these areas. I also knew that this initial team would be appealing to investors. It was a bit different for us as we all worked in a tech company in the Philippines for our day jobs and then the initial 5 of us formed a team and worked nights and weekends. So it was not that difficult to attract as we all knew each other and had worked with each other for 3-5 years. The main challenge was keeping up a pace of day job, followed by nights until 2 a.m. and then working Saturdays and Sundays. Doing this for 18 months non-stop was really hard going, but it paid off in the end. The initial plans for the initial team of 5 were to have shares in the corporation to really feel a part of what we were doing. That is what we did and nothing changed. Building your initial team is the most important thing you can do in a start up, as you may have an idea, but so do thousands of other people, how you execute that idea is what makes the difference. Building a core quality team covering all the key areas in developing a product is also a huge asset to investors, which is why many acqui-hires occur. To build the initial team I think you need to be social and open with your idea. 4) Take your time on finding the right people, otherwise it will be hassle in the long run. Mr Augustianne Laurenne L. Barreta, a Senior Developer at Pinoy Auto Traders. I wanted to do something different, I have been around my full-time job for a while and everything was becoming redundant. With Pinoy Auto Trader I get to start fresh, instead of doing and debugging legacy projects I get to start one. Sure it was financially challenging but it’s part of the adventure. One of the challenges was having to work late hours since I still had my full-time job back then. Going home at around 3AM and going to work at 8AM was not an easy thing to do but I survived, we all did, and I think we all enjoyed it. I still code and have my usual responsibilities, but the overall scope of my role has changed considerably. Before, I only needed to worry about doing my job right and getting as many features finished as possible. Now that we have a technical team I need to make sure everyone is meeting PAT standards, and also making sure the team is ok on a day to day basis, thinking of the team and not just my own tasks. I still do the same stuff I did back then but it has lightened up, kind of, since we have more people on board. 4) Challenges are inevitable in a startup environment. Prior to joining Pinoy Auto Traders, are you ready for these challenges? Or did you know what you might have to face? Yes and no. I know what startups are and I know how challenging they can get, but when I got onboard, I did not know we would get as far as getting investors. But when it came to it, I knew I was in for an adventure. Now, we’ve come to the end of the interview and if you want to know more about what Save22 can do for you, click on this link: More About Pinoy Auto Traders.